Organizing this site has always been a challenge, and the more it grows, the more difficult it is to find ways that everyone can find what they need. With more than more than 250 videos, and more than 1500 pages of experiments, science photos, Learnalong units, etc., scrolling through all the pages to find what you want can be overwhelming. This page is a general guide to make it easy to find the things you want on The Happy Scientist. First, I use Drupal as the Content Management System on the site, and while I LOVE Drupal, its search module is pretty limited. It searches for exact matches, so a search for "bird" will probably not find "birds". Still, it can be useful. If you are trying to find a video that you liked, try to remember one word from the title of the video. Search for that word instead of trying to guess at the entire name. By far the easiest way to find content is to use the Resources by Topic pages. You will find these in the left hand column on every page. If you are looking for resources on birds, go to the Life Science page. If you are looking for information on minerals, go to the Earth Science page. Life Science : living things, cells, human body, adaptation, behavior, etc. Process of Science : variables, controls, observation, measurement, etc. This page also has specialized topics such as microscopes, misconceptions, and science fair. Free Content : This page has videos and other pages that are free for everyone. These will change regularly, and are there to let visitors get a sample of the site before they subscribe. Once you get to the right Resources by Topic, look over the topics in the right hand column. This will let you narrow your search. Check the box for the topic you are interested in. 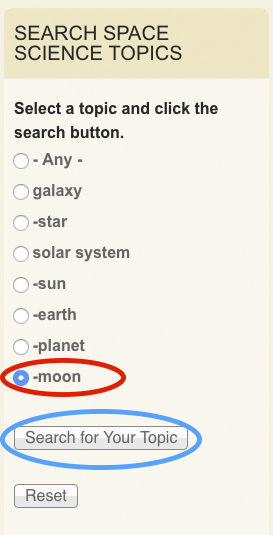 For example, here I have checked the topic of "moon". Then click "Search your topic". That would show me all of the videos, experiments, and other pages that have something to do with the Moon. Using these topic lists should make it easier for you to find the information you want. It can also help spark your interest in new topics, so it is a great way to explore the site. I know that many of you focus on the videos, but don't forget about the text pages. There are hundreds of them, with a mix of experiments to try, techniques for doing things, and posts of some of my adventures. There are also hundreds of science photos with challenge questions to test your knowledge and learn new things. As you are looking through the choices, check out the topic links beside each video. They will give you an idea of what is covered in that video, but you can dig deeper by clicking on one of the topic links. That will take you to a list teasers from all of the pages that are tagged with that topic. If you still cannot find what you are looking for, it may be because I have not produced anything on that topic yet. In that case, please let me know. I am always looking for new topics.